Jungle Bird, was made famous by Tom Selleck, in the 1980's Hawaiian detective television series, Magnum P.I.. Suddenly, the huge success of this great TV show caused people everywhere to want to look like the handsome Tom Selleck. The women wanted to date him, the men wanted to look like him. The show continues it's popularity into this century through reruns and DVD's. 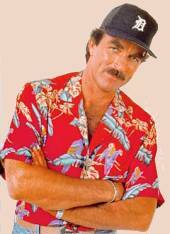 The Original Magnum P.I. Jungle Bird shirt worn by Selleck was donated to the Smithsonian's National Museum of American History, where it is currently on display.